In response to the earlier discussion, I feel like the balance between readability and stylishness has been solid, though it's hard to tell if it would be an issue without playing the game. I really like the contrast between the day and night stages. Would these be separate levels or would an individual level cycle between them? Thanks! I was thinking it would be a bit of both. Similar to Mario World or Yoshi's Island where you might be underground for part of the stage and when you come back to the surface it's a different time of day or a different background. 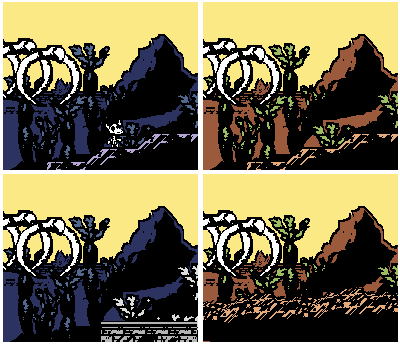 I might test the palette change during a stage idea at some point and use that for some stages as well. And yeah I think the readability can always be tweaked at some point if it continues to be an issue. Here's a few different ideas I've been trying out. The backgrounds on these are the unaltered version of the background from the previous post so they're a bit dirty at the moment. 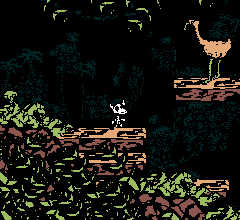 I'd probably tweak the wood platforms to look a bit more natural too if I decide to use these. 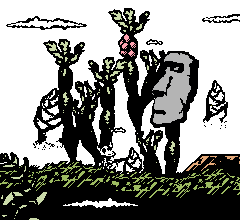 This foggy white background one is heavily inspired by super mario land. The little clouds should look nice in motion with the different parallax speeds. 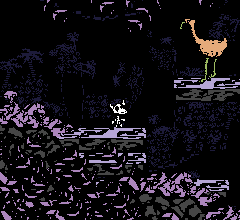 I'll probably try to animate the mockups from the previous couple posts next. Your artwork and choice of colors is great! I look forward to see/experience how the gameplay is. I also liked the visuals of Seas of Saturn. What are you planning to do for music? I love the look of this project so far. As others have said, the parallax effects really shine. I love the art style, too. Keep up the good work! verdog - Thanks! I really like how that one turned out, here it is in motion. sidbarnhoorn - I have a short demo track for now. I'd like to get something like the music from Bonk's Adventure or like the cave theme or the title screen theme from Yoshi's Island. I've been sick for a while so I'm sticking to just making art for now but eventually when things turn around I'll look into music and the physics a bit more. Glad to hear you're liking the looks of this and seas of saturn, thanks! andyfromiowa - Thank you! 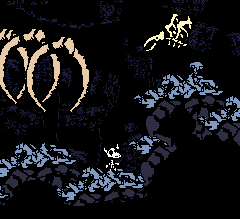 Hopefully I'll be able to add more layers to the parallax at some point.